Gran Turismo For PlayStation Vita: How Long Must We Wait? It took Polyphony Digital five years to finish PSP GT. We hope you're patient. It's a foregone conclusion that Gran Turismo will appear on PlayStation Vita in some fashion. Sony will commission Polyphony Digital to harness the machine's power to produce (in theory) one of the most advanced portable driving simulator's the world's ever seen. 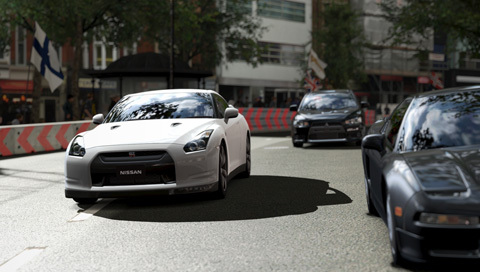 We expect Gran Turismo Vita to look this good. Yup, five years seems about right. Just imagine a near photo realistic experience, with painstakingly detailed cars careening around turns, then accelerating down a straightaway in Manhattan, the car whizzing through Times Square. Switch to cockpit view, and you'll be able to look around by tilting the right analog stick, admiring the vehicle's lifelike interior. Such a game could easily become a system seller, similar to its predecessors. If it's anything like the PSP version, though, we'll need to wait years before it's completed. As much as we love Polyphony's work, the company takes its sweet time. Gran Turismo PSP was officially announced in May 2004 but didn't see a release until October 2009. Although it was a commercial success, critics and fans were displeased at the lack of a career mode and car upgrades. The fact that it took five years to bring this game to stores was a reminder of the lengths Sony and Polyphony will go when it comes to Gran Turismo, leaving us to wonder how long it'll take to produce a new entry for PlayStation Vita. Polyphony has always done a good job shoving hundreds of cars into these games. Now with Vita in its hands, it may attempt to up the ante, perhaps even surpassing Gran Turismo 5's totals. If that's the case, we could be in for a long wait. Think about where you'll be in five years. Prospective employers normally ask that question during job interviews. Well, here's a possible answer: playing Gran Turismo Vita.